Touch Of Belle : Sweater Weather Tag! 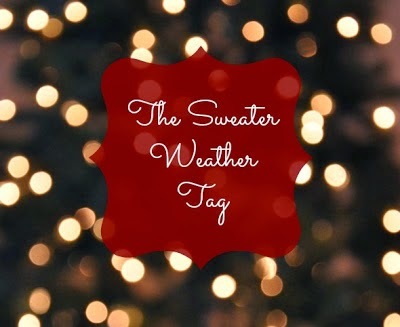 Today I'm going to be doing the sweater weather tag! I'm really excited to give it a go! I have been loving yankee candle in the scent Christmas cookie, oh my goodness it smells divine, I literally cannot get enough of it! Other than that I love anything sweet or fruity! I'm not a huge fan of coffee and tea so I would choose hot chocolate any day! Dark lips! I don't think winged eyeliner suits me so it would be dark lips all the way! This is quite a hard question! I am loving Marc Jacobs daisy dream at the moment, but its more of a summery fragrance! Scarves! I'm not a hat person at all, I just don't like the feeling of wearing a hat! I have a massive collection of scarves though! At this time of year I love dark red shades, they are just gorgeous! I LOVE both! I normally put jeans on if I am going out anywhere but if I'm just staying in or having a lazy day I will put leggings on! Getting to put the fire on and drink lots of hot chocolates! Songs that get you into the Christmas spirit? I love Fairytale of New York, Its just one of those songs that remind me of Christmas! So there is the sweater weather tag! Let me know your answers to one of the questions below!